Once upon a time... there was a DC-6 ETP-10025 of the Fuerza Aerea Mexicana, reported as such at Santa Lucia AB,Mexico in sep93. In 1995 it was reported as written off after an emergency landing while registered as HK-1776W for a company called LANC Columbia (DC-6A); date of accident: 22jul95. JP Airline Fleets (1995 edition) offered its former identity: N11565 and the company (LANC Colombia) stationed at Cartagena. Their fleet also comprised DC-3 HK-2497 and Aerospatiale SE210 Caravelle HK-3948X. Propliner magazine no.72 (1997), in an article by Steve Kinder, stated registration as HK-1776W and reported it as stored at Villavicencio,Colombia.... Steve's article "South American Serenade" described HK-1776W as "anonymous" and mentioned LANC as "apparently closed down". So it was repaired after its crash ? And the titles were removed ? Flown back to Mexico? Years later, HK-1776 was photographed in take off (on a testflight) at Villavicencio,Colombia by Chris Mak in Feb99, after 18 months of storage; the photo was published in Propliner no.78 (1999, p.9) . But the colourscheme is clearly different from HK-1776 below: though in B&W it shows a colourscheme of metallic with a single cheatline. It is clearly registered HK-1776 (with LANC Columbia titles), but not HK-1776W. The cheatline is different than shown on the photo below, too. HK-1776 overshot the runway after (again?) a testflight on 04jul99 with engine problems: 5 (crew) dead and the DC-6 damaged beyond economic repairs. Was HK-1776W repaired after its crash in 1995, only to crash again in 1999? Dan Willink wrote "... use of the 'W'-suffix indicates that it was now an Executive Aircraft." Here is the following theory: HK-1776W and HK-1776 are (were) different aircraft; HK-1776W may have been the ex/Mexican reregistered ETP-10025, while HK-1776 of LANC was another DC-6. 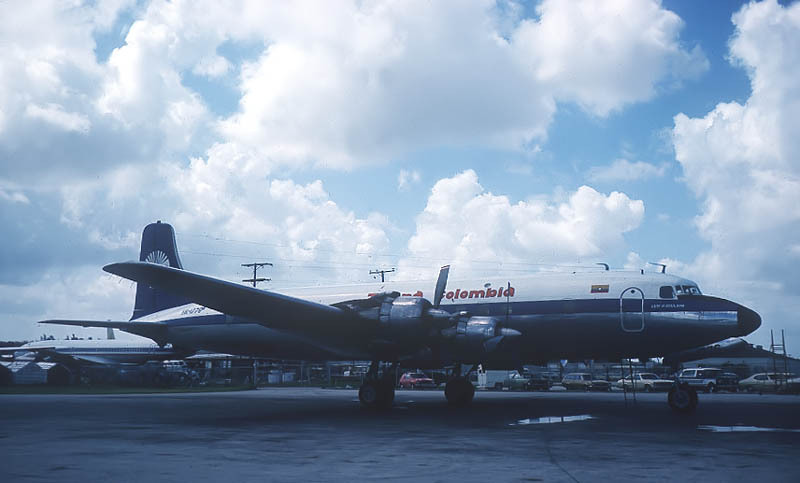 Douglas DC-6A HK-1776 of TAMPA Colombia at Miami (07Aug1978). Name below cockpitwindow is Luis H Coulson. The colourscheme is similar to that of a photo published in 'Sky Trucks', by Karl-Heinz Morawietz and Jörg Weier, page 54, taken at Bogota in 1980. DC-6A c/n 45499/1011 has been mentioned by various sources to be a candidate for either one of the above. But is it ETP-10025 / HK-1776W or HK-1776? And was HK-1776W a fake (not officially registered) registration, perhaps applied for illegal or covert operations ? Some sources seem to offer DC-6BF (c/n 45220) as a candidate for HK-1776, as N95BL (c/n 45220) vanished from sight in the early 1990s (last seen 1991); other sources claim N95BL was scrapped (at Miami) during those days, but surely that would have gone noticed? Or did N95BL get involved in illegal ops? Not uncommon in those days. ->see photo below of N95BL. ETP-10025 had been impounded by the Mexicans (under which tailnumber, N95BL?) in the early 1990s and was put to good use by them as ETP-10025: was this DC-6 c/n 45220 and did this one end up as HK-1776W ??? The last 2 could be a different airframes. "Are you still searching the identity of LANC DC-6 HK-1776? My theory is: c/n 45499 ! I have original slides of Tampa, Aeronorte and F.A. Mexicana (showing the double reg), and I have several slides of (fake) 'HK-1776' of LANC taken at Bogota and Villavicencio. My slide of ETP-10025 in 1994 shows HK-1776-W being painted out but visible. I am pretty sure that was the end of the real HK-1776. 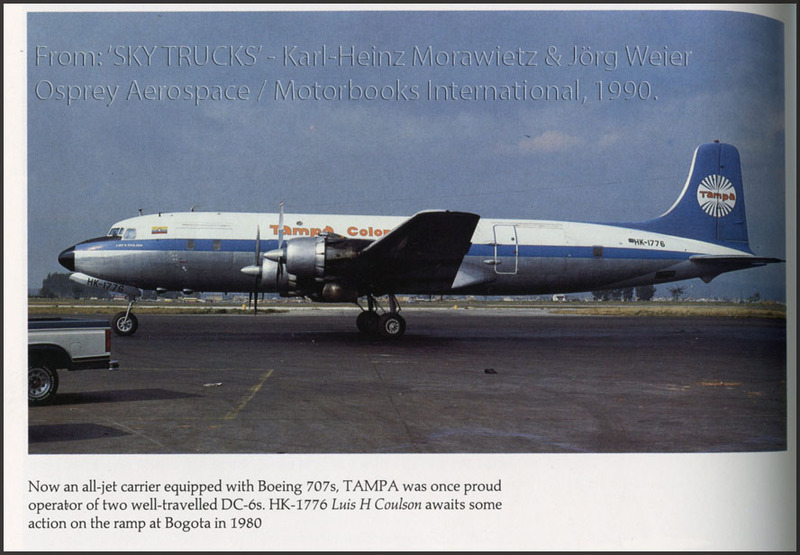 I believe that original HK-1776 (c/n 45499) ended with La Fuerza Aérea Mexicana (FAM) and 'HK-1776' is an ex/ La Fuerza Aérea Colombiana (FAC) DC-6 (but which one?). The windows are completely different and also the antennas. And HK-1776 has a very small window at the end of the belly, above the normal windows. FAC sold several DC-6s in the early 1990s and by law, they had to be used for spares, not to be flown again. One of them was then 'HK-1776', a possibility to fly the aircraft again with a registration that ended in Mexico some years before! 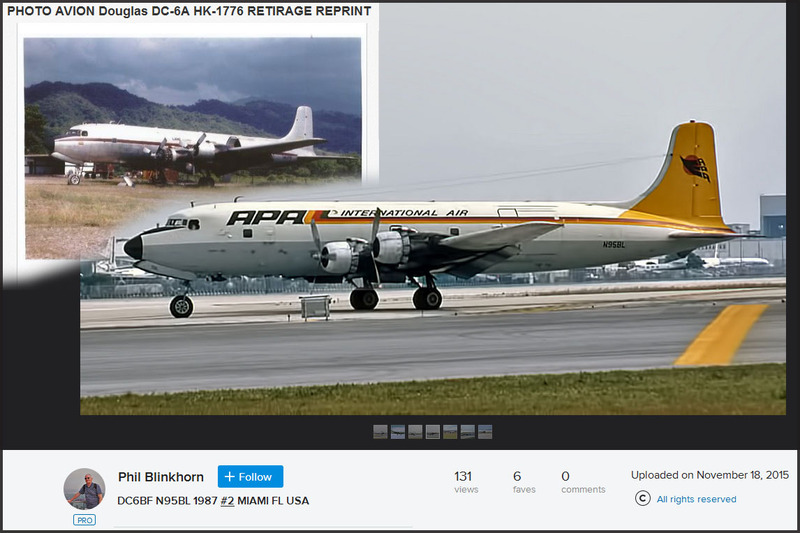 So which of the ex FAC DC-6 was 'HK-1776'...? It was not FAC 902, 904 and 909, because I have slides of these 4 DC-6s, and they have different windows and antennas. Nor can it be FAC 905 or 908, because they were parked as wrecks. And it is not 910 either, because this one got the second HK-1700 in Colombia's registry; let's call that one HK-1700(2). But concluding, this fake 'HK-1776' must be either FAC 901, 903, 906 or 907! ->If the -W suffix stood for VIP aircraft, perhaps we could ask ourselves if any of these flew VIP's in its military career? Something similar happened in the 1980s with DC-3 HK-337; the one I shot in the 1970s is not the same as the one with the same registration I photographed in the 1980!. My response would be that in my research (of many years) into Victor Bout's operation, I found it was (is?) not uncommon to paint an unregistered (thus illegal) registration on an aircraft and even fly it. This could go a long way in countries with slack governmental control and supervision, e.g. in Africa; as long as they would not be seen together. The fake registrations in Nicky's theory might have been for the purpose of masquerading a previous identity, a smokescreen for the owners or operators with probable illegal operations in mind. Anyone seeing a tailnumber painted on it, even looking it up and seeing a registered owner, would probably not think of investigating further. The original HK-1776 'Luis H. Coulson' in 1980 at Bogota, a photo reproduced for the sake of this search. N95BL DC-6BF c/n 45220 'N95BL last noted in 1991, painted grey&white fuselage, FAA issued a temp CoA on 03Jan1992 lasting 30days - for ferry flt? Is candidate for HK-1776, but no confirmation (Matt Miller, 2004). Note that the described colourscheme fits with the 'LANC Colombia HK-1776' depicted in the composite photo below! 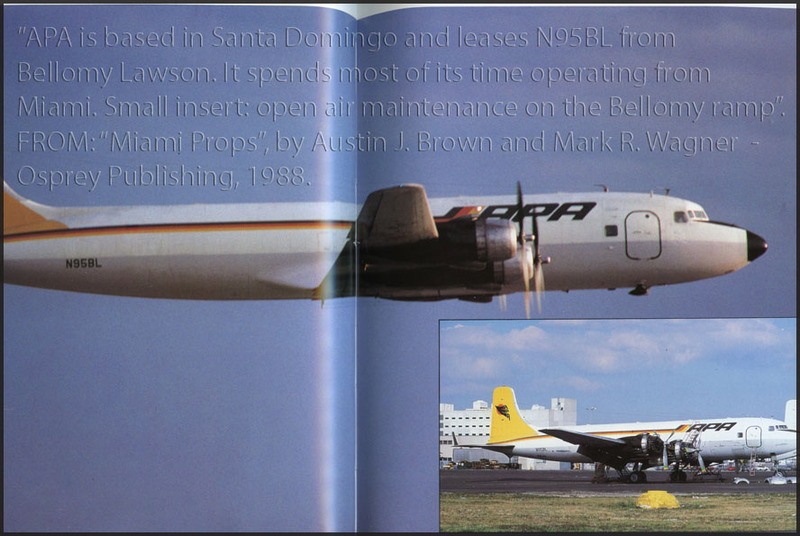 From "Miami Props" an image of N95BL; let us compare antennas: rather similar. But..
Aerocosta and Aerosucre Colombia) this was earlier and returned to Bellomy-Lawson as N6584C and later N95BL. for APA Int'l Air and Aerial Transit while leased from Bellomy-Lawson. However... ATDB.aero concludes on the history of c/n 45220 'ultimate fate obscure'! CIVIL AIRCRAFT REGISTER OF COLOMBIA: HK1776 DOUGLAS DC-6A (45499) 31/01/1975 -- SOCIEDAD EXPORTADORA DE CARNES DE LA SABANA DE BOGOTA LTDA. LINEAS AEREAS DEL NORTE DE COLOMBIA LTDA. "I found a photo of the LANC HK-1776 and carefully compared it to photos of N95BL, both photos taken from left quarter viewpoint. Other than the paint scheme, the two aircraft are indistinguishable..."
I made screendumps of both images in these links and matched them into one picture; pity the LANC 'HK-1776' in the eBay advert cannot be seen in a larger size nor has details of when & where taken. But is does show 'LANC' titles and it does show photos of HK-1776(2) are in circulation! Stef added soon after: "I should point out that N95BL was a DC-6B, delivered new to Northeast Airlines. It was converted to cargo in the 1970s, using a standard Douglas factory rear cargo door assembly. These were heavy duty doors that were made for pressurized loads. It is said that these cargo doors were removed from various DC-7CF's that were scrapped in the late 60s and 70s; for example, ex-Airlift aircraft. Some other DC-6Bs were converted by Bellomy-Lawson to cargo using custom made doors, engineered by the DER, Jim Addison. These were light weight doors which had C-46 type latches, incapable of withstanding any pressurized loads. Those door frames were not very substantial and when the aircraft was loaded with cargo, I often had to struggle to get the doors closed. This aircraft had ventilation air scoops and vents at various places because the pressurization system was removed during cargo conversion. You can see these features on both N95BL and HK-1776." Comments and/or images will be welcomed!